The permeability map that we chose comes from a numerical ground-water flow model developed by Jorgensen and others (1996). The rock matrix consists of low-porosity mudstones and dolomudstones. However, the permeability map of Jorgensen and others (1996) is regional in scope and does not reflect local differences in porosity and permeability. Therefore, one must realize that because of dissolution and dolomitization, the Arbuckle Group rocks are locally some of the most porous and permeable in the Mid-Continent region. It is often true that reported porosity and permeability values are much lower than the true values (Puckette, 1996). Puckette offered two examples of this phenomenon. 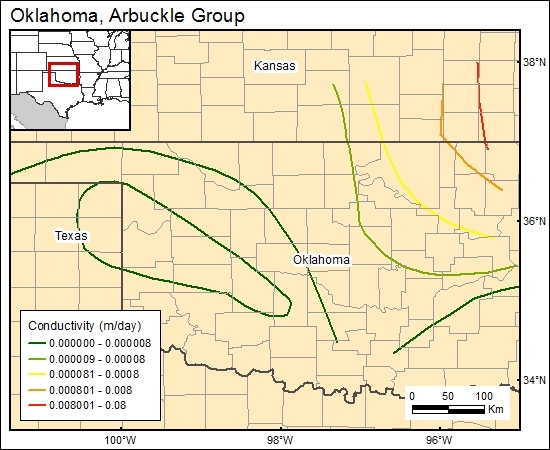 The producing section of Cottonwood Creek field, Carter County, Oklahoma, has produced more than 4,000 bopd. Yet the reported porosity and permeability are 2 to 3 percent and less than 0.01 millidarcy, respectively (after Read and Richmond, 1993). In large part this is due to the nature of the karsted rock, which during coring yields proportionately much more of the low-porosity rock than the porous, sometimes brecciated and cavernous zones (Puckette, 1996).